Remember Me: The Dark World of No Pain, Regrets or Remorse. 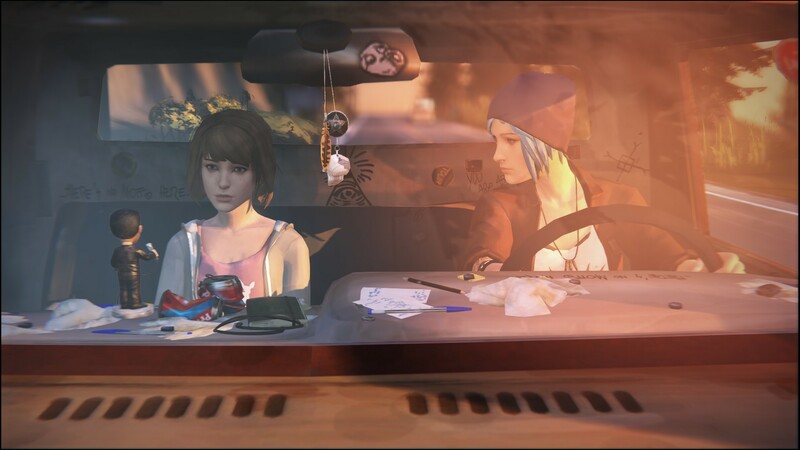 My previous post on games and female protagonists sparked an interesting conversation among my friends as we tried to recall all the games we’d played that had either a female lead character or at least one that played a major role in the game’s story. Even though we play a fairly broad range of titles the number of strong female characters we could name was dwarfed by their male counterparts, something that seems particularly odd now that 45% of all gamers are women. Thankfully that seems to be changing (albeit slowly) as games like Remember Me are becoming more frequent, even if they have to fight for their very existence. You awake in an all white cell, your memory being wiped clean as part of the intake process for the prison you’re being kept in. A doctor approaches you and starts asking you rudimentary questions, trying to figure out just how much of yourself remains after your treatment. It seems that you’re somewhat resistant to the Sensen’s memory wiping ability and need to be sent elsewhere for further treatments. However whilst you’re on your way to what appears to be your final doom you’re contacted by a man called Edge who helps you escape. The world you’re then thrust into however is a dark and terrifying one that’s under the control of the Memorize corporation. Not directly however, but simply because their technology allows anyone to forget the most painful moments of their life turning them into memory junkies. Edge wants you to fight them and you can’t fight the compulsion to do so. Remember Me is pretty much what I’ve come to expect from current generation console titles as it’s able to make full use of all the hardware power that’s available to it. 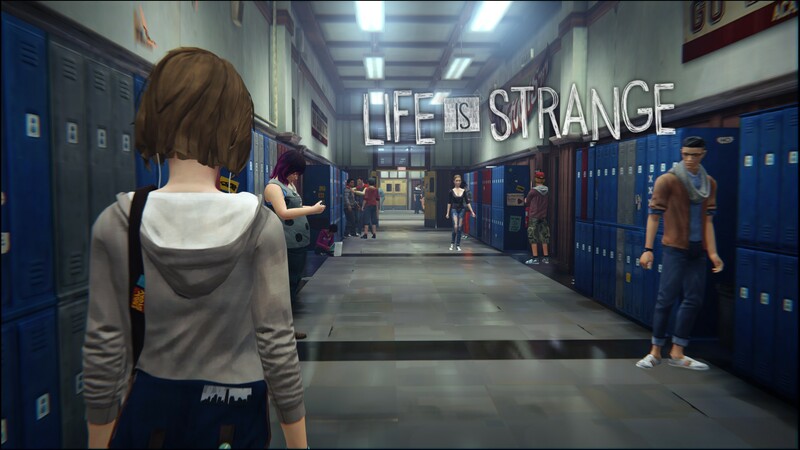 The game incorporates all the modern effects: high amounts of motion blur, high resolution textures and it’s own glitchy overlay whilst also keeping its frame rate at a solid 60 fps. I will take slight issue with the lip synching as, outside the cutscenes, it’s either done extremely poorly or just not at all. 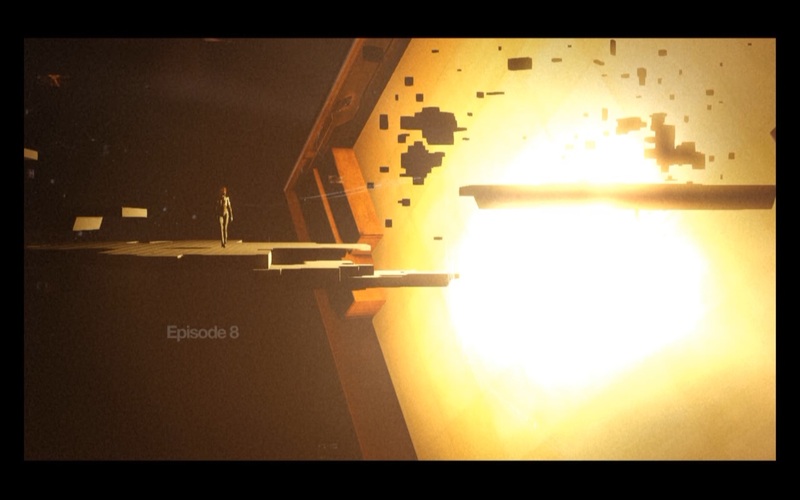 It’s really the only let down in the whole audio/visual experience as pretty much everything else is spot on. 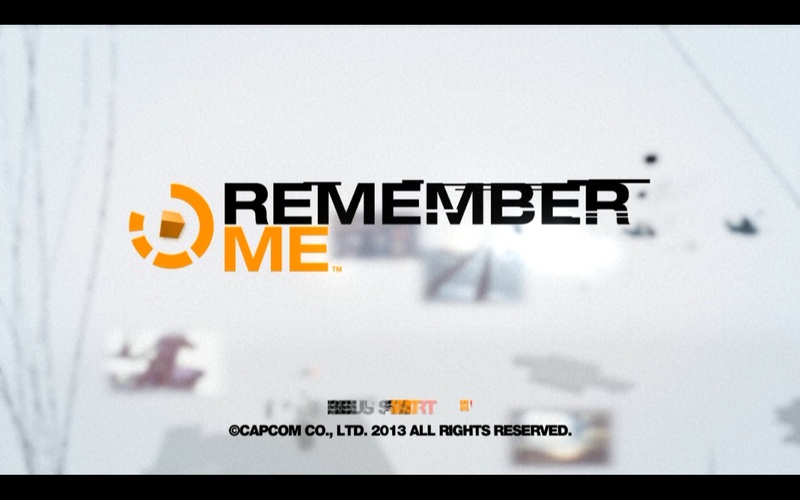 The game play of Remember Me is a mix of beat em up style combat, logic puzzles and an unique mechanic whereby you remix someone’s memories in order for them to do what you want them to. Whilst the fundamentals of each of these core mechanics will be familiar to most long time gamers they all have their own twist to them that makes them unique to the Remember Me world. 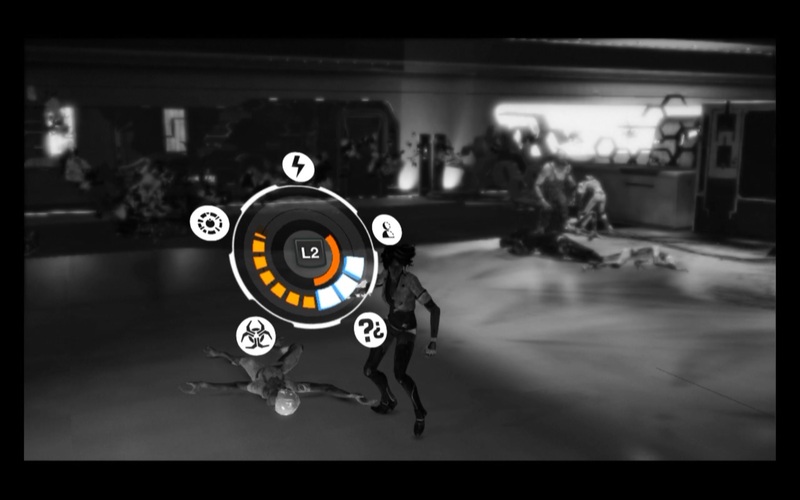 By far the most intricate of them all is the combat system which you can heavily customize to suit your style of play. The logic puzzles and memory remixing are somewhat simplistic by comparison but are still an enjoyable part of the overall game play. Combat follows the Arkham Asylum/Arkham City model of beat em up where you spend the majority of your time attempting to land combos whilst enemies throw themselves at you. It’s a little more nuanced and is reminiscent of fighter game combos where you must hit every button at the right time and in the right order to pull it off. However the combo aid at the bottom of the screen helps a lot and it’s also far more forgiving than any fighter game I’ve ever played. The really cool thing about the combat system though is the customization allowing you to change how the combo works and what benefits landing it will give you. You have 4 types of “pressens” which are mapped to the buttons on the controller. The first is the damage one which, as its name implies, will increase the damage dealt by that particular strike. Regeneration ones will give you health upon landing a hit and cooldown pressens reduce the time between the use of your special abilities (more on those later). The final one is the chain pressen which inherits all the pressens that came before it making it a powerful tool for creating combos that are truly crazy. There’s also the twist of pressens having more effect the further along in the combo they are which, when you’re dealing with an 8 hit combo, can make a pressen that felt useless suddenly become really viable. You can also chop and change between the pressens during combat, allowing you to adjust your fighting style to the challenges at hand. You’ll be doing this more often than you think as whilst towards the end you’ll have enough pressens and combos available to you to cover any situation initially you’ll either be short of either of them at any given time. My original 8 hit combo felt like the perfect fit for pretty much any situation but when you’re surrounded by 8 enemies at a time it became incredibly hard to land and thus needed to be reworked into a 5 and 3 hit combo respectively. There’s also certain types of enemies that will require you to build a combo just to take them down especially if their death relies on using one of your special abilities. 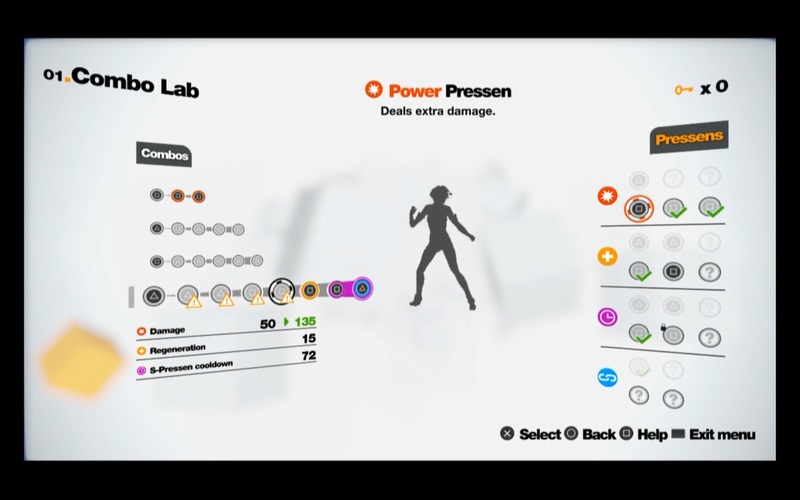 Augmenting your regular punches and kicks are s-pressens, special abilities that allow you to deal with the varying challenges much easier and quicker than you could do otherwise. They’re unlocked gradually, always as part of the game throwing a new type of enemy at you that basically requires that s-pressen to take them down, and how you use them is really up to you. 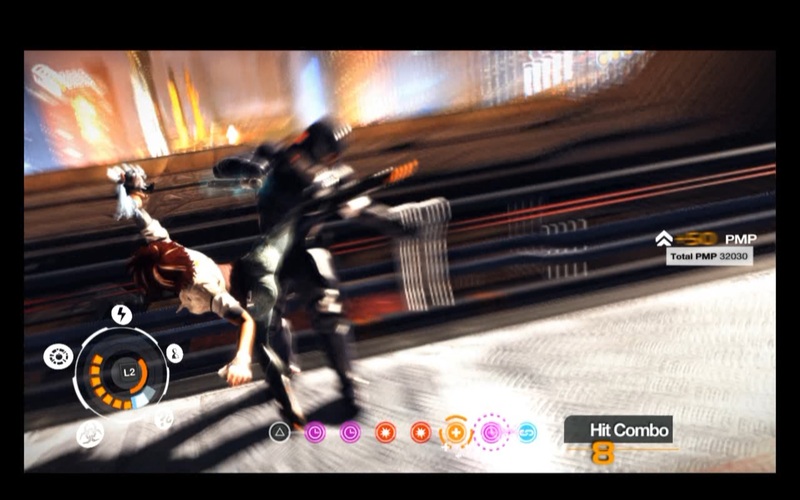 They also rely on focus, shown as the white/blue bar above, which is generated whenever you hit or are hit by someone. In the beginning they’re quite cool and feel like the ultimate get out of jail free card but eventually their effectiveness starts to drop off and their use becomes something of a necessity. 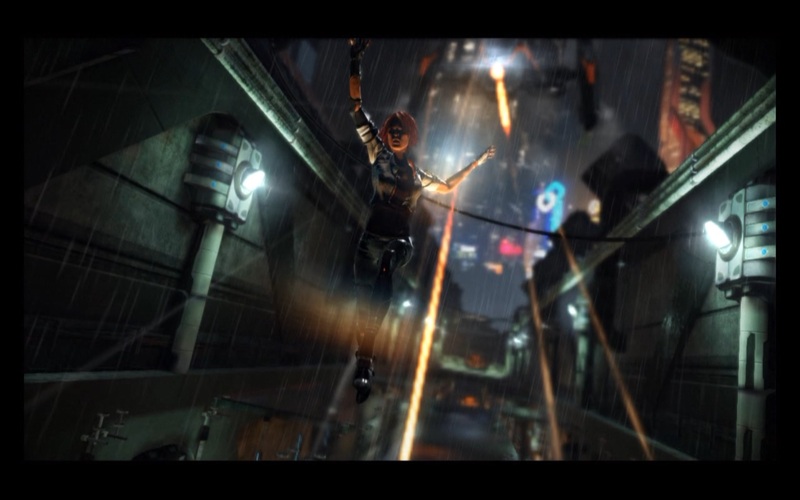 This is probably where Remember Me starts to struggle as ramping up the difficulty involves nullifying the abilities that have been granted to you whilst throwing ever increasing numbers of enemies at you. It’s something that the whole games industry is struggling with at the moment, the idea of providing challenge whilst keeping the player engaged, but simply throwing more bodies or removing player options is most certainly more towards the anti-fun part of the spectrum and should honestly be avoided. Of course you could argue that due to its hack ‘n’slash nature Remember Me implies that this is how the challenge will be ramped up but I find that a poor excuse for a game that incorporates such a nuanced combat system in the first place. I don’t pretend to have a solution to this, indeed even the game designers I know say that this is something that the best struggle to achieve, but it’s definitely one of those things that will count against a game in my view. 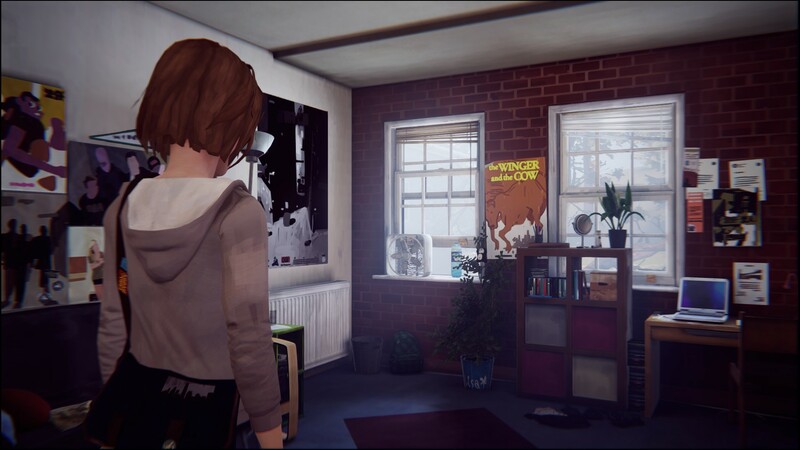 The memory remixing puzzles are quite awesome as they play on the idea of small changes having big impacts on how something would play out. Whilst the outcomes are relatively fixed, I.E. there’s no emergent behaviour possible in any of them, the different outcomes are quite varied and the difference between a successful remix and a failure can be something as simple as doing something too early, or too late. There’s also a ton of red herrings in all of them, things that when modified won’t do anything at all, which keeps you second guessing your decisions right up until everything falls into place. I can’t really talk about it much more without spoiling the crap out of some of the puzzles but suffice to say it’s really good despite the fact it didn’t feature as prominently as I thought it would. Outside of the memory remixing there’s a bunch of puzzles that make use of Remembranes, fragments of memory that you purloin from other people in order to move forward. They start off as being easy timing puzzles, usually involving you avoiding detection from robots that move in a predictable pattern, but they eventually graduate into riddles that unlock codes forcing you to decipher the ramblings of a man who was driven insane. They’re a small part of the game however and you could usually stumble through them without thinking about it too hard although I will admit I got caught on the second to last puzzle involving the hominus/m3morize/evolutio words. One point that bears mentioning is the strange, strange world that Remember Me exists in. Now I’m not talking about the major plot points that drive the story that revolve around the Memorize memory technology, more that whilst the developers have strived to create a world that feels alive they’ve in fact created one that’s just simply weird. There are robots everywhere, and I mean everywhere, but apart from the patrol robots not a single one will react to you, not even ones that are in places where you’re not supposed to be (despite being a wanted criminal). They’ve obviously been put there to make it feel like the city is alive in some way without them having to code in a lot of people (which do exist, but are few and far between) but instead it creates this weird atmosphere where you’d expect them to react to you but they don’t. You’d probably be better just leaving them out because having them there just creates this extremely odd atmosphere. Remember Me’s story is quite gripping once you get over the stumbling block of Nilin implicitly trusting Edge and doing everything he asks. They touch on this very point with the inter-chapter monologues that help to bridge over some of the more glaring plot issues, but it essentially leaves Nilin without any particular motivation for a good chunk of the game. It does morph into a much more rich and detailed story towards the end however, even though quite a lot of things are still left unclear, and the last couple hours were intense enough for everyone in my house to stop what they were doing in order to watch everything to the end. It’s definitely far above what I’ve come to expect from these kinds of games and Dotnod Entertainment should be commended for making a strong female lead, even if there’s a few rough edges. 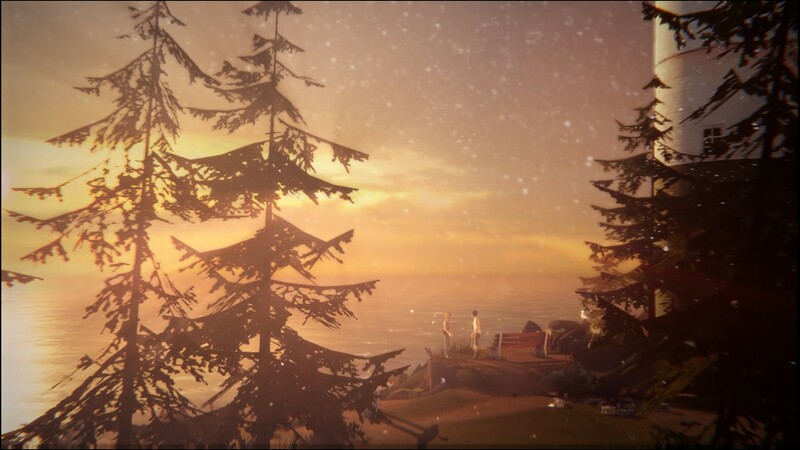 For a new IP Remember Me does incredibly well, showcasing some incredibly refined game mechanics with a top notch story that combine to produce a well rounded and highly polished game experience. It still has some teething issues, something which is not uncommon to games trying out new ideas, but it manages to pull the majority of them off without sacrificing other aspects of the game. A strong female lead is also a welcome addition something which hopefully won’t be considered a controversial choice for too much longer. I thoroughly enjoyed my time with Remember Me and would recommend it for anyone seeking out a fresh experience that’s unlike anything else that’s come before it. Remember Me is available on PlayStation3, Xbox360 and PC right now for $79, $79 and $49.99 respectively. 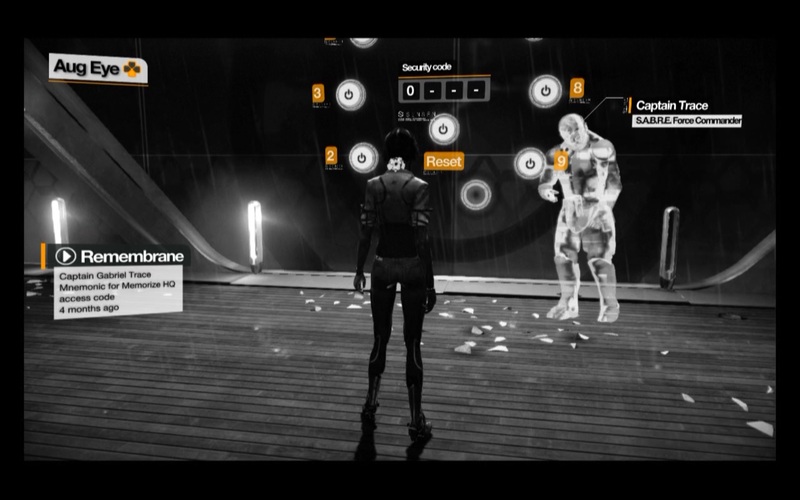 Game was played on the PlayStation 3 on the Errorist Agent difficulty with around 8 hours of total play time and 39% of the achievements unlocked.